In a report that was released August 2013 by the USAF, the results of a Lockheed Martin F-22 aircraft crash point to a chaffed power feeder cable as the likely cause of failure. On November 15, 2012, the F-22, attempting to return to base, crashed just short of a runway in Florida. The crash resulted in total aircraft loss at a total cost of nearly $150 million. If you are interested in arcing, here is an article on the Impact of Series Arcing. The sequence of events from the moment of failure is shown in the figure below. 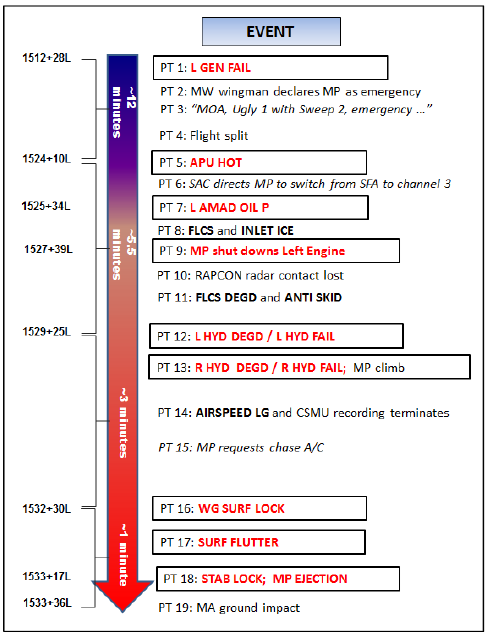 The sequence of events shown start 23 minutes after takeoff when the first indication of problems appeared, “beginning with the MP’s left generator fail”. This was immediately followed by oxygen generating system failure and making the radio’s inoperable, and the situational displays. Shortly thereafter, an attempt was made to reset the left generator which failed. The post crash analysis found that the fire “originated in the left side of the AMAD bay and affected components throughout the entire AMAD bay”. The investigation of the materials recovered from this area found wires with damage consistent with electrical arcing. “The molten areas of the feeder wire had a significant amount of titanium present, indicating that it was chaffing against the adjacent titanium materials, either the hydraulic lines or the FS610 titanium bulkhead” (metal transfer is typically a good indicator of electrical arcing). According to the report, “The system (Lectromec: perhaps a generator control unit) sensed the initial arc via its electrical feeder fault protection, causing the left generator to shut down and provide the fault indication to the MP”. The report claims that the arc energy may have been between 1– 12kJoules. Lectromec’s estimation is that this would mean that the arcing event lasted between 8 – 90ms. This brief arcing event was sufficient to breach the titanium hydraulic line and ignite a fire. The limited damage to the wires is shown in the following figure. Notice the limited damage to the wire from the arcing. Although there was clamping intended to keep the power feeder cable away from the structure, the clamping did not provide sufficient clearance to prevent chaffing. This crash is another example of the importance of wire system risk assessment and proper maintenance.